Flags made of silk construction with gilt painted stars represent the height of expense when it comes to 19th century flags. This particular flag, made in the manner and style of a military battle flag, is most likely an early smaller format company presentation color presented to, and kept by, an officer of a Civil War Union Company. The presence of fringe around the top, bottom and fly edges of the flag, and the presence of the flag's original silk-over-wood braided tassels, are both hallmarks of a military battle flag. The sleeve hoist of the flag, which is made of the canton and stripe silk itself, is yet another trait almost exclusively seen on flags made for military use. The flag still possesses its original hemp rope inside the sleeve, bound to black painted metal rings on both ends. Silk flags of this period rarely survived because of the use of weighted silk. In the 18th century and very early 19th century, silk was sold by length, rather than by weight, but in the later 19th century, silk was sold by weight. To make the silk heavier, it was often soaked in mineral salts which absorbed into the silk and, over time, made the silk brittle. We can see evidence of this process in this rare flag. At some point, the flag became wet, and the water caused the salts to accumulate along the outer edge of the wet spots. The accumulated salts were even more caustic to the silk in these areas, causing the silk to become more brittle than usual in these locations. Despite the fact that there is some breakdown in the silk, this flag is one of the best preserved and most intact silk battle-format flags from the period. More than 95% of the original silk is present and the colors of the flag are fresh and vibrant. The flag is machine stitched and professionally manufactured. The gilt stars are tilted to the 11 o'clock position, appearing nearly inverted, and they are formed into a pattern that I've seen referred to as "global rows", where vertical alignment of the stars form arcs, much like lines of longitude on a flat map of the globe. The flag is currently in the process of being pressure mounted and framed to keep it well preserved. In that process, the flag is placed on a pillow of batting covered by cotton velvet. As part of the process, similar colored silk will be placed behind the flag, which will effectively mask the losses due to the breakdown in the silk, and the flag will once again look like new. 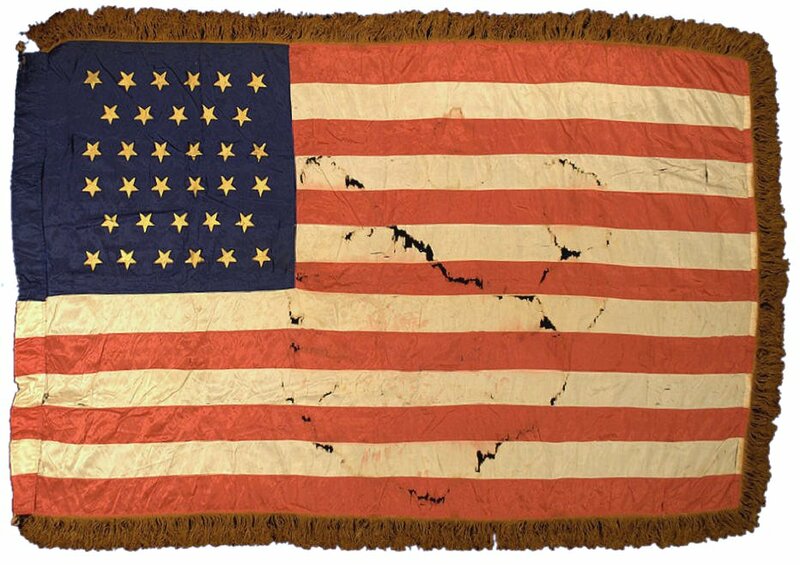 Thirty-four star silk flags of the Civil War era, featuring gilt-painted stars and of the military battle flag format, are exceptionally rare, and this pattern of stars, in a relatively small size of three feet by five feet are practically non-existent. This example is a true treasure and survivor from the opening years of the Civil War.